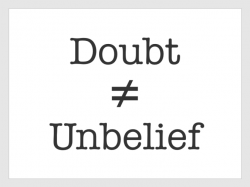 1 How did Jesus deal with doubt? 4 Is all doubt bad? Jesus did not condemn doubt. He simply pointed to the evidence. William Branham admitted that we had a right to doubt him. This is the correct approach. If Paul commended the Bereans in Acts 17:11 for not simply accepting his word but going to the Bible to prove it, why wouldn't we take the same approach to William Branham? ...you have a right to doubt me, but not God. Have you got any right to doubt me? Not a bit. Because I come here the first of this service and I told you of what God had said. Now, you, as a man, you had a right to disbelieve me. But when God turns around and speaks that I've told the truth, then you shouldn't disbelieve me anymore. Because if you disbelieve me now, you disbelieve Him. You've heard me never, as far as speaking, I'd say, "God made me His prophet." I've heard people say, on tape they picked it up when the inspiration was on, but that was Him speaking, not me. See? Better for Him to tell you that, than for me to tell you that. See? More you can believe Him; you got a right to doubt me. And you have a right to doubt me if you wish to. Now, you can doubt me, I'm a man. You got a right to. But you mustn't doubt God. William Branham at times confused doubt with unbelief, but they are actually two different things. The first time that the devil met Jesus Christ, he doubted Him. Doubt always is of the devil. That's where the first sin come. There is no other sin but doubt. Unbelief is the original and only sin. You have no right to doubt me. Abraham was a man who was deep into a life of faith. He has left everything … his country, his culture, his family … in trust on the promise of God. He is also the man who half the human race, essentially three world religions, looks to as a paragon of faith, who has just had, first of all, a word of the Lord, a clear, audible revelation, but he was also filled with with doubt. So how do you think you’re going to do what Abraham could not do? Probably, you’re never going to get past it. That means there will always be to some level of doubt in anyone’s life. There has to be. Doubt, in a sense, is a problem that never goes away. It is an inevitable thing, but look at this incredible balance the Bible has here and everywhere. What an incredibly nuanced, balanced view of doubt. Does God say, “How dare you question me?” Never, and yet does God say, “Well, that’s the way it is. We all live with doubt and we can’t help it”? No. On the one hand, God does not condemn. On the other hand, he challenges it. He keeps coming after him. There is a remarkable balance. A faith without some doubts is like a human body without any antibodies in it. People who blithely go through life too busy or indifferent to ask hard questions about why they believe as they do will find themselves defenseless against either the experience of tragedy or the probing questions of a smart skeptic. A person's faith can collapse almost overnight if she has failed over the years to listen patiently to her own doubts, which should only be discarded after long reflection. Believers should acknowledge and wrestle with doubts — not only their own but their friends' and neighbors'. It is no longer sufficient to hold beliefs just because you inherited them. Only if you struggle long and hard with objections to your faith will you be able to provide the grounds for your beliefs to skeptics, including yourself, that are plausible rather than ridiculous or offensive. And, just as important for our current situation, such a process will lead you, even after you come to a position of strong faith, to respect and understand those who doubt. But even as believers should learn to look for reasons behind their faith, skeptics must learn to look for a type of faith hidden within their reasoning. All doubts, however skeptical and cynical they may seem, are really a set of alternate beliefs. You cannot doubt Belief A except from a position of faith in Belief B. For example, if you doubt Christianity because "There can't be just one true religion," you must recognize that this statement is itself an act of faith. No one can prove it empirically, and it is not a universal truth that everyone accepts. If you went to the Middle East and said, "There can't be just one true religion," nearly everyone would say, "Why not?" The reason you doubt Christianity's Belief A is because you hold unprovable Belief B. Every doubt, therefore, is based on a leap of faith. ...the only way to doubt Christianity rightly and fairly is to discern the alternate belief under each of your doubts and then ask yourself what reasons you have for believing it. How do you know your belief is true? It would be inconsistent to require more justification for Christian belief than you do for your own, but that is frequently what happens. In fairness, you must doubt your doubts. My thesis is that if you come to recognize the beliefs on which your doubts about Christianity are based, and if you seek as much proof for those beliefs as you seek from Christians for theirs — you will discover that your doubts are not as solid as they first appeared. Paul says, “We live by faith, not by sight.” Paul never says, “We walk by faith, not by reason.” Paul never says, “We walk by faith, not by thinking,” because faith and reason, faith and thinking are not opposed to each other. Faith and sight are opposed to each other, because faith is being controlled by the truth. He doesn’t say you need more faith. He doesn’t act like faith is this mysterious thing that has to be whipped up, some people have and some don’t. He says, “You know what you should have been doing. Where is your faith? Get it out. It ought to be here.” Jesus specifically applies this to possessions. What Jesus is saying in Matthew is simply that an enslavement to visible things calls into question our faith in invisible things. Enslavement to visible things radically calls into question our real faith in invisible things. If you know there’s a God who’s taking care of you, who owns everything, that changes you totally in your attitude toward other things. ↑ New American Standard Bible: 1995 Update (LaHabra, CA: The Lockman Foundation, 1995), Ge 15:2. ↑ New American Standard Bible: 1995 Update (LaHabra, CA: The Lockman Foundation, 1995), Ge 17:17. This page was last edited on 18 February 2017, at 23:11.